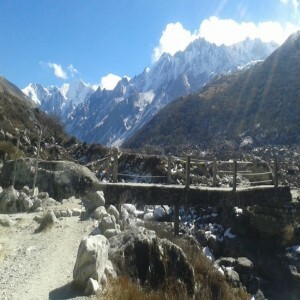 Langtang valley Trek Besides mountain views. Langtang Valley Trek or Langtang view trek is one of the Best popular Trekking in Nepal Langtang Valley Trek a captivating walk amidst the majestic Himalayas, plethora of flora and fauna with the local Tamang community grace. Prior to the devastating earthquake in April 2015, Langtang valley was one of the most alluring and equally celebrated trekking destinations. However, with recent restorations, the valley is en route to retain its former glory. The trek to Langtang does not just offer the opportunity of the brief romance with nature but allows you to involve yourself to support the lives of the locals in the region. The 11 days trek begins after your arrival in Kathmandu. The city boasts great cultural diversity while providing the home to numerous sites with the historical and religious background. After the brief tour of Kathmandu valley, we drive towards Sybrubensi enjoying the views of beautiful mountains, rich culture, and traditions of the villages. We start our trek from the lower region of Langtang Valley across small villages, farmlands and verdant forest towards Kyangin Gompa. From Kyangin Gompa, the trail climbs gradually to Tserko Ri where you can experience the enchanting sunrise over the Langtang ranges. The region was once an important trading route as it borders Tibet. You can still see the influence of local culture in the area. This trek also takes you through villages with unique geographic and cultural lineages where you can be awed by the humility and hospitality of the local residents. We will also visit the villages of Langtang region that were heavily affected by the earthquake. Our exciting trek ends back in Kathmandu where we started. Reasonable Treks And Tour is an organization that prioritizes the needs and demands made by the client and provides excellent services of every kind. The company also boasts 10 years of history that has seen it rise as a nationally well-reputed and renowned agency to provide security and comfort of our valued clients. Visiting Langtang village and Kyanjing Gompa. Visit to The local Cheese Factory in Kyanjing Gompa. 1Arrival in Kathmandu (1337 m) and transfer to hotelAs soon your arrival in Kathmandu, a representative will greet you and transfer you to your hotel. We will discuss the contents of the trek later. In the evening, you will be served a special dinner that reflects Nepali food culture. 2Short tour of Kathmandu and trek preparationWe will spend the day exploring the capital, Kathmandu. We will visit different religious and historical places in Kathmandu including Pashupatinath Temple, Swayambhunath Temple, Boudhanath Stupa, Kathmandu Durbar Square and others. We will discuss the trek and welcome any queries. We will also buy proper gears and equipment for the trek. 3Drive to Sybrubensi (1,503 m) -07 hrs Early in the morning, we leave Kathmandu for Sybrubensi. The drive will be on winding roads and we might get the opportunity to view beautiful mountains including Manaslu, Annapurna, and Ganesh Himal. We reach Sybrubensi late in the afternoon and you can spend the rest of the day as you wish. Overnight in Sybrubensi. 4Trek to Lama Hotel (2,410 m) - 06 hrs After breakfast, we begin our trek towards the Lama Hotel along the Langtang Khola. We ascend through uninhabited oak and rhododendron forests to reach Bamboo village (1,970m). We again continue as the trails lead us through a forested path with plenty of local wildlife. We ascend to a bamboo forest and reach the Lama Hotel after crossing it. Overnight in Lama Hotel. 5Trek to Langtang (3,430 m) - 06 hrsWe continue our uphill trek towards Langtang Village. You will be able to observe the euphoric views of white peaks of Langtang range after reaching Ghoda Tabela, Langtang Village was affected by the earthquake in April 2015. Here you will be visiting the sites that were affected the most by the earthquake and can assess the means that are being taken to recover from the destruction. Overnight in Langtang village. 6Trek to Kyanjin Gompa (3,830 m) -04 hrs.The next day, we continue our journey towards Kyangin Gompa which is a principal monastery of the region. We pass through small streams, yak pastures and moraines for 3 to 4 hours to reach Kyanjin Gompa. Here you get mesmerizing views of mountain peaks like Langtang Lirung (7,227m), Langtang II (6,596m) and numerous others. Overnight in Kyangin Gompa. 7Rest day at Kyanjin Gompa and explore Tserko Ri (4,984 m)We spend our whole day acclimatizing to the high altitude and exploring Tserko Ri. The trek again continues early in the morning. The trail passes through different yak pastures and rough terrain. The sunrise that can be observed from the top of Tserko Ri is simply marvelous. We get panoramic views of the Langtang Lirung (7,227m), Naya Kanga (5,844m), Gangchempo (6,888m), Langshisa Ri (6,810m) and other numerous peaks. 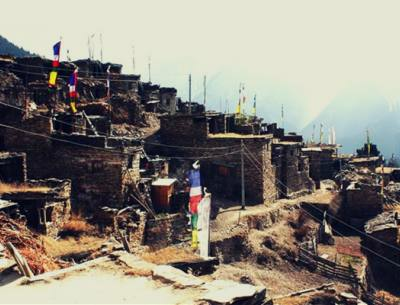 After delightful experiences in the lap of Mother Nature herself, we trek back to Kyangin Gompa. Overnight in Kyangin Gompa. 8Trek to Lama Hotel - 06 hrs After breakfast in the morning, we retrace our steps back to Lama Hotel. 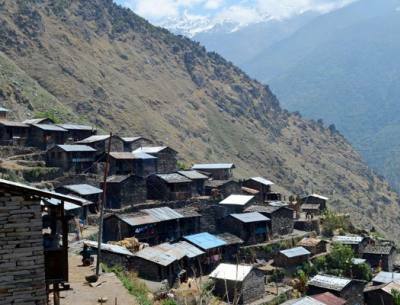 The descend includes walks through different forests and beautiful Tamang villages. We get the usual treatment of the scenic pleasantries. On the downhill walk, we come across various Himalayan wildlife that makes the journey interesting and invigorating. The ecstatic feeling of breathing the Himalayan air continually refreshes us. Overnight in Lama Hotel. 9Trek to Sybrubensi - 05 hrsThis is the last walking day of the trek. We again retrace our steps back to Sybrubensi bidding farewell to the Lama Hotel and the gorgeous Langtang region. The trek will be easier than the ascend given that our trek will walking downhill. We walk through previously passed rhododendron forests along the Bhote Koshi River. Overnight in Sybrubensi. 10Drive back to Kathmandu After an early breakfast, we drive back to Kathmandu. After reaching Kathmandu, you can pick up gifts and souvenirs for your family and friends. Overnight in Kathmandu. 11International DepartureToday, our Langtang Valley Trek comes to an end. A representative will help you with your final departure. Please feel free to provide any suggestions regarding any aspect of the trek so that we can provide better service in days to come. We did 11 days Trek with Reasonable Treks And Tour / Anil Dhungana provided Very Helpful And professional assistance in planning for Langtang Valley Trek, he’s is Organization for 11 Days Trek, Mr. Anil He is Recommendation Trekking Guide and porters were very friendly and they adapted the trip to our wishes. We take a lot of photo during The Langtang Valley Trek, Time We did it the Wonderful and amazing experience to reach the trek, guide he gives to everything information details on the way I Show village and mountain. Really enjoyed the Langtang Valley Trek, Thanks to Guide And porters we want to highly recommend this company and staff for other travelers. Thank you so much, Mr. Anil, we really happy for your Trip. We will back Next Time!! Langtang Valley Trek Located at the northern region of Nepal, Langtang lies near the border between Nepal and China. It is regarded as one of the most magnificent and easily accessible trekking destinations in Nepal. Langtang Valley Trek is a home to numerous peaks including Langtang Lirung (7246m), Langshisa Ri (7205m) and Langtang II (6596m) among many others. You can also see a majority of prominent Himalayan ranges from here. Langtang Valley Trek With the beautiful natural phenomenon, you will also get to experience the culture inherited from their Tibetan lineage. The majority of the population living here are Sherpas and Tamangs. Langtang Valley Trek is also known to have religious sites to attract pilgrims of Hindu and Buddhist faith. Accommodation on Langtang Valley Trek. Everywhere you travel, you will find that Nepali people are very charming. You will be utterly convinced and satisfied with their hospitality. You will find quality tea houses properly spaced between you treks. These tea houses offer comfortable accommodation and good meals. Tea houses or lodges you find along your path will offer basic twin rooms with attached or common bathrooms. Some lodges may offer you hot showers with additional charges for the service. Most tea houses along the lower altitudes will offer you internet but you will not find internet at higher altitudes. A night’s stay costs you around 500 Nrs excluding the food charges. Transportation on Langtang Valley Trek. You can either take a bus or hire a vehicle to reach Langtang Valley Trek. You will find public buses leaving for Syabrubesi for which you will have to book tickets to get a seat. Hiring a private 4 wheeler jeep is also a feasible idea. However, this can be expensive as they will charge you by the day and may even charge you for the fuel. The drive to Langtang Valley Trek is a scenic one and you can enjoy the fleeting sights of the settlements and countryside of Nepal. Food & Meals on Langtang Valley Trek. Traveling at high altitudes, you cannot expect to get the fanciest of meals. But you will surely get to taste the kind of food people eat in such areas. Tea houses will have several dishes to offer you. As per usual, you will find a larger a variety at lower altitudes and as higher you go, your choices for meals narrow down. One notable thing in The Langtang Valley Trek is, at many places in this region you will only find vegetarian food. One item you will definitely find is the Dal Bhat set. This set includes Rice, lentils, vegetables and even meat in some places. Some lodges may offer you their own versions of western food such as pizzas, pasta, French fries etc. Other snacks you may find are soups, momos, noodles etc. Backpack list on Langtang Valley Trek. Proper clothing: Strong durable warm jackets, sweat absorbent clothes for trekking, inner layers, undergarments, trousers, and socks. Gears: hats, beanies, buff/balaclava, gloves, and Hiking/trekking shoes. Accessories: trekking poles, sunglasses, lamps/headlamps, water bottles, first aid kits, medication tablets, toiletries etc. Additional items: snacks, electronic gadgets (power bank, kindle, tablets), game cards etc. You should have a proper bag that can accommodate all the necessities. If you hire a porter, you can add another bag under the weight limit for your porter to carry. Guides & Porters on Langtang Valley Trek. It is highly recommended that you have a guide with you. Hiring a porter depends on what kind of a trek you are going. Guides can help you in every aspect of the trek. They can guide you through the routes as well as help you with any emergencies. Guides are like companions for your trek. They don just carry out their tasks as guides but help you with the lodges and all communication tasks so that everything is smooth. They will keep you on schedule and make sure everything is going according to plan. The number of guides and porters depends on the group you have. The larger the group, the more porters and guides are required. Electricity/ Recharge & Internet on Langtang Valley Trek. Since the availability of Wi-Fi is now widely spread, you will get internet services at various tea houses around the lower region. The normal Nepali sim cards will also work at the lower altitude regions of Langtang Valley Trek. However, once you gain great attitude, you will neither find internet not will the normal sim cards work. You will need the sky sim to make calls, which provides coverage in many areas. You will find landlines at some tea houses. Similarly, electricity will be available at tea houses and as you go higher you will be charged for its use. You will need to pay hourly up to 2-4$ for charging your appliances. Group Size & Crew Member on Langtang Valley Trek. You can choose your own group size according to your preference. You may have to hire more porters and guides according to the size of your group. You may require a set of crew members if you are planning to go on camping treks. You will need porters, guides, cooks etc. They will help you set up camps as you go. For other treks, your group members must be skilled in navigating. However, travel agencies will assist you with guides, assistant guides, and porters. They will help you get through the well-established routes. You may also travel alone if you wish but it depends upon the agreement stating that you are responsible for your own safety. Medical Facility on Langtang Valley Trek. It is highly recommended that you bring medications that you think will be required after ample research. You can carry some common medications that can be used to deal with a headache, flu, stomach problems, etc. If you travel with a guide, he will also most likely have a first aid kit. Most guides will also be trained in first aid procedures and basic medical and life aid. There will most likely be small medical shops around the villages, which can help you with the primary treatment and common medicines. You can easily find hospitals at lower altitudes. Altitude Sickness on Langtang Valley Trek. One of the risks of traveling to high altitude is altitude sickness. When you travel at high altitudes, the oxygen density lowers. To keep going, you have to maintain a slow and steady pace exerting minimum pressure on your body. The biggest threat of altitude sickness is that it cannot be cured or gotten rid of instantly. Symptoms of altitude sickness include shortness of breath, fatigue, insomnia, headache, nausea etc. If you experience any of these, stop your trek and take some medications or descend right away. Medications such as Diamox can help you in dire situations. By staying hydrated, getting adequate rest and acclimatizing to the location you can avoid altitude complications. If such cases do arise, consult with the trek guide to take further actions. Acclimatization on Langtang Valley Trek. Acclimatization is an absolutely necessary part of any high altitude travel. This is the only way your body can deal with the increase in altitude. Acclimatization helps your body produce more red blood cells, this increases the oxygen-carrying capacity of the blood thus making your body adjust to the altitude change. This process can require up to hours and even days. But it is best to not take any risk and give your body the maximum amount of rest you can. You are recommended to spend at least one night or more at every checkpoint for acclimatization. This will be just enough to lower the risk of any disease you can get at high altitudes. Best Season to travel on Langtang Valley Trek. You need to know when the best time to go traveling is, it is one of the most important things you will have to prepare before leaving. By choosing the best dates to travel, you will minimize the risks of slippery trails and weather issues. You never know when it might rain or the views might get interrupted by fog. The best possible season to travel is the autumn season. Typically occurring around early October till early December, this will be the best season to go traveling around this region. During this time, the trails become dry, and views become clear. You will also have minimum chances of bad weather. Insurance & Rescue on Langtang Valley Trek. Insurance is one of the key things you must have covered if you are traveling at high altitudes. Usually, your travel insurance policy does not easily cover high altitude travels. While traveling at high altitudes you may face health issues and require immediate medical attention or even a rescue operation. You will need a rescue team to carry you to the nearest hospital. Sometimes, helicopter rescue services are required too. As such facilities can be really expensive, it is best to have insurance to cover all of these charges. You can find insurance providers who also cover your insurance at high altitudes. Booking & Payments on Langtang Valley Trek. You will find plenty of travel agencies who have varieties of offers for a Langtang Valley Trek at decent prices. You will have to pre-fix the dates and schedule your trek through the platform the agency will provide. You also have the option to let the agency choose the best dates for your trek given that you provide them with a time period of your availability. 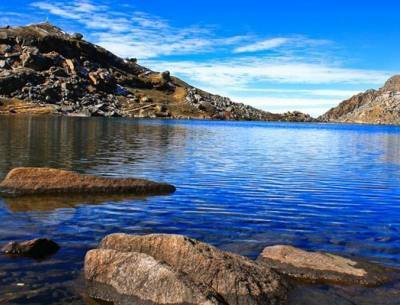 To book a trek, you will have to comply with the terms and agreements set by the agencies. You will be required to send necessary documents such as passports and visas. You will be expected to provide an advanced down payment for your trek. You may cancel your trip but if you have booked a plan you can be charged a certain amount of money depending upon the agreement set before. We provide the price per person is fixed as stated below. We provide a 5% discount for a booking of 5 or more than 5 people. If a group booking of more than 15 people we provide discount up to 10% for your trip. Note: Start date is your arrival date in Nepal and end date is the returning date from Nepal.